Contemporary 5-Light Ball Pendant Light, 40" x 10"
Overhauling an existing décor can be very overwhelming. We believe a better approach lies in using smarter, more decorative accents that serve a practical and fashionable purpose. Our range of accent trays delivers this blend with effortless ease. Available in wide range of materials, from premium hardwoods to stainless steel and glass, these trays will help you add a new dimension to the countertops in your kitchen, living room, and dining area. You can even use them on the patio tables to make the outdoors look more organized. These décor essentials help to make the surroundings clutter free, presenting handy space to keep smaller items, including cosmetics, keys, wallets, etc. 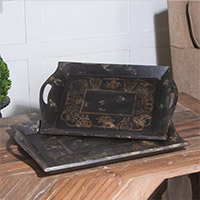 Our online range of accent trays is bolder and better than existing options on the web. You get trays in all sizes, different handle options, variety of colors, and a wider range of suitability for different types of decors. From the offbeat Galiana Ceramic Tray to the classically themed Melani Antique, or the modish Aniani Tray, browse through our world of trendy accent trays! Accent Tray There are 9 products.